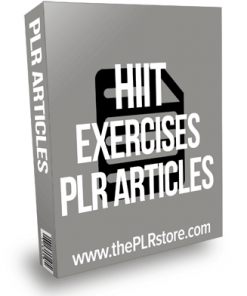 HIIT Workouts PLR Listbuilding Report has everything to build an email marketing list and profit in one of the hottest fitness niches and private label rights. 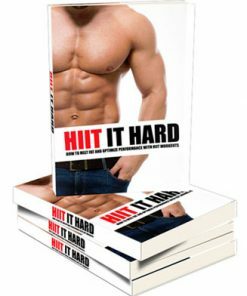 HIIT is an abbreviation for ‘high intensity interval training’ and it’s a training method that’s used by millions of people all over the world to torch their excess fat, stay in shape and boost their stamina/strength. 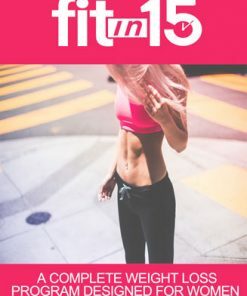 While the focus of this short report is about 5 ways to make your HIIT workouts more interesting, let’s first see what HIIT is and how beneficial it is for you. 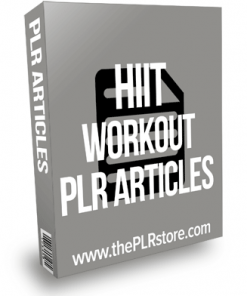 HIIT workouts generally range anywhere from 7 minutes to 30 minutes long. Most women may wonder if one can achieve anything in 7 minutes. After all, the norm is to spend 45 minutes or an hour on the treadmill. 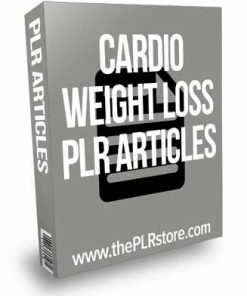 You’d be amazed to know that a 7 or 10-minute HIIT workout might actually burn more calories and fat than a 45-minute cardio session. It is that powerful. 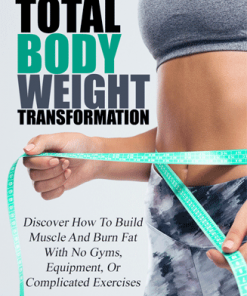 It’s not easy but it definitely delivers results. 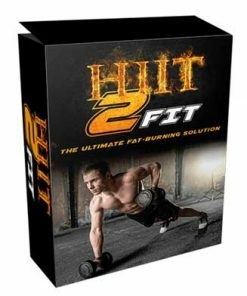 The reason HIIT is so effective is because of EPOC. You’re probably already tired of the abbreviations. EPOC stands for ‘excess post-exercise oxygen consumption.’ It is the main reason high intensity interval training is so effective. 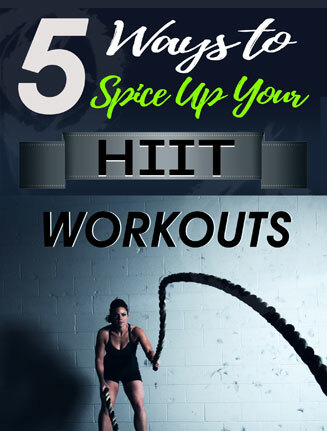 When you do a HIIT workout, the intensity is so high that it becomes an anaerobic activity. Your heart will be pounding and you’ll be panting. 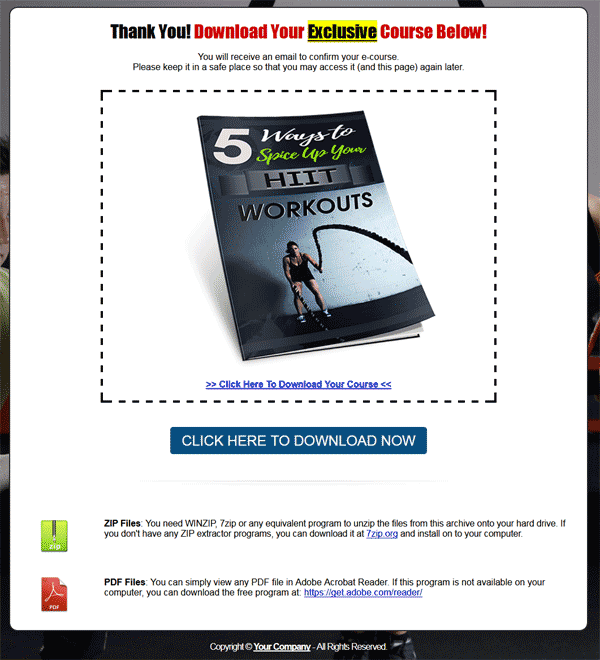 Give Away Report – 21 page quality lead magnet that details 5 ways to spice up your HIIT workouts. The report comes in several formats including, Word DOC, Open Office ODT and plain text, so you can easily edit, customize or brand it as you want. You also get a PDF version. Squeeze Page – Modern landing page that was designed to help you build a bigger list with a progress bar and two set process that has shown to increase optin rates and build bigger lists faster. It is standard HTML so it’s easy to edit. Just copy and paste your autoresponder optin code into the squeeze page, upload and it’s ready to build you a list on auto pilot. 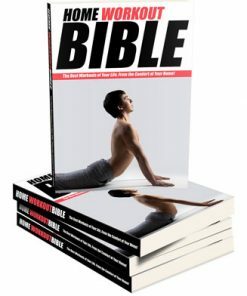 Comes with a download page as well. Images – 3 different versions of the report cover and two PSD’s for the cover so you can brand it or edit as you want.